The common Shepherd's Purse, the one you'll find peaking through cracks in roads and paths all over the world, has heart-shaped fruits that resemble old fashioned leather purses. You know, the kind carried by any self respecting sheep herder. The Southern one has fruits resembling nothing more than the common almond. Nothing fancy, nothing purse-like. 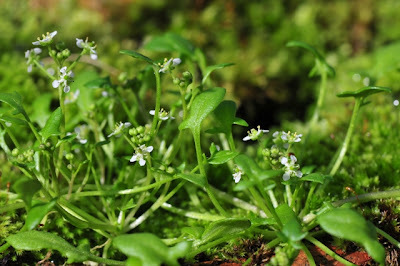 Our native species carries the Shepherd's Purse moniker presumably because it was once thought to be in the same genus as the common one, Capsella. But enough of common things. Ballantinia antipoda, the Southern Shepherd's Purse, grows on a single hill top near where my mother lives. Truly. That hill top is Mount Alexander, which sounds a little grander than it really is (with apologies to my Castlemaine comrads). 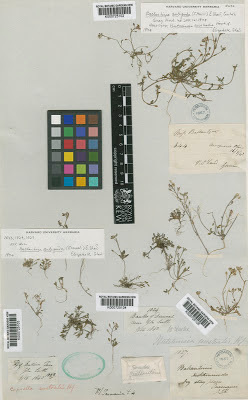 Still, Ferdinand Mueller, the first director of the Melbourne's botanic gardens visited Mount Alexander in the mid nineteenth century, discovering what he called Capsella antipoda. There were more collections in Victoria around that time, from near Carisbrook, Whan, Werribee and Fullagar. 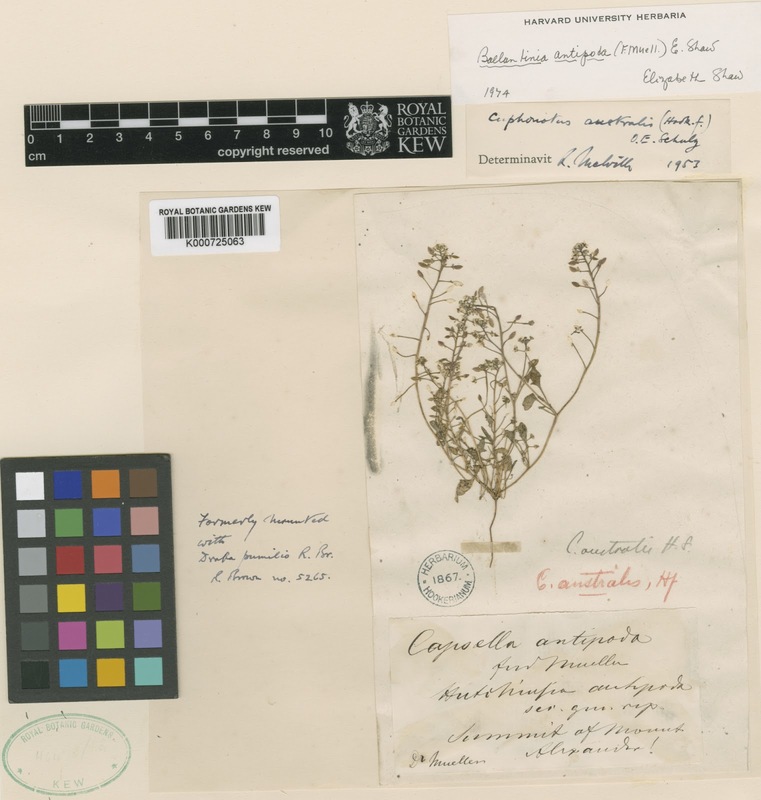 Ninety years later, and ironically after it was thought to be extinct, the species was plucked from Capsella and placed gently in its very own genus called Ballantinia. Mary Ballantine had, in 1842, collected the one and only specimen of this plant found outside Victoria, on the Macquarie Plains of Tasmania. 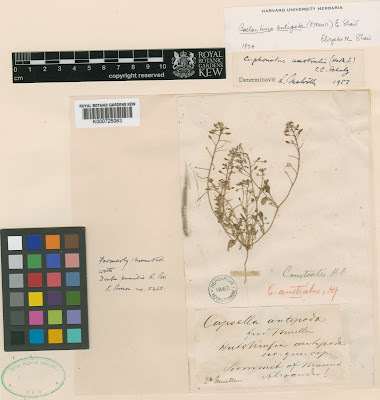 And here it is, more than 160 years later, in the herbarium of Royal Botanic Gardens, Kew. Soon more mothers will live near the Southern Shepherd's Purse. The Department of Environment and Primary Industry are going to propagate seed from the Royal Botanic Gardens' Conservation Seed Bank and try to restore this species in a few of its original habitats in Victoria. That seed was collected from plants on Mount Alexander after its rediscovery in 1983 and grown up in the Royal Botanic Gardens Melbourne nursery for further seed harvesting. This is important stuff. Although a recent survey of Mount Alexander found 7,000 plants, they are grouped into ten small populations and numbers fluctuate from year to year. A fire at the wrong time or a few too many nibbling animals could easily send this plant to extinction in the wild. It's a bit hard to explain what makes this plant distinctive. To the untrained (and even lightly trained) eye it looks like any other of the smaller members of the cabbage-family (Brassicaceae). Still if you see a tiny plant with a rosette of hairy, sometimes divided, leaves sending up a flowering stalk with oval-shaped fruits, and you live near my mother, it might just be Ballantinia antipoda. Note: For more information see the Environment Australia's charmingly titled SPRAT site or one of the Recovery Plans. 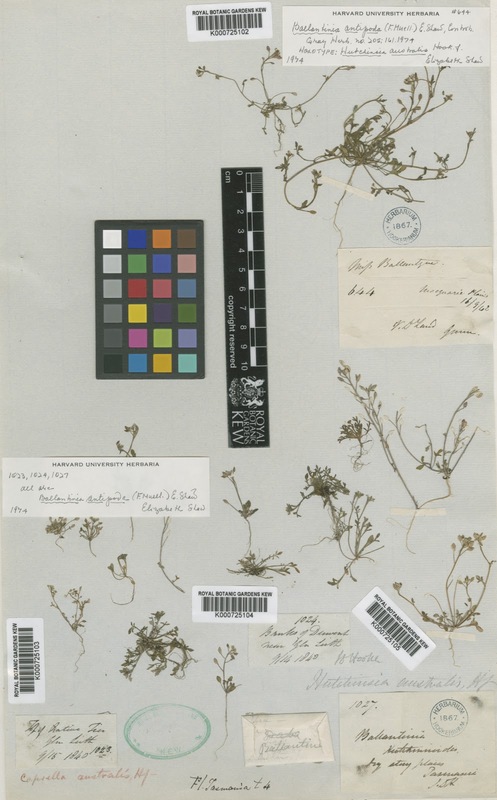 The images of specimens collected and pressed in the nineteenth century are from the on-line Kew Herbarium Catalogue and the live plant is from the Royal Botanic Gardens Melbourne nursery, taken by Neville Walsh. 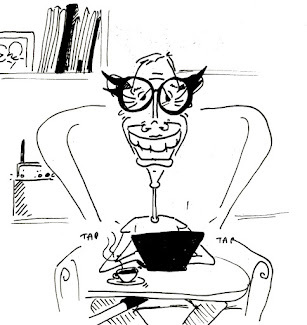 Thanks for the factoid about Mary Ballantine. In exchange (?) 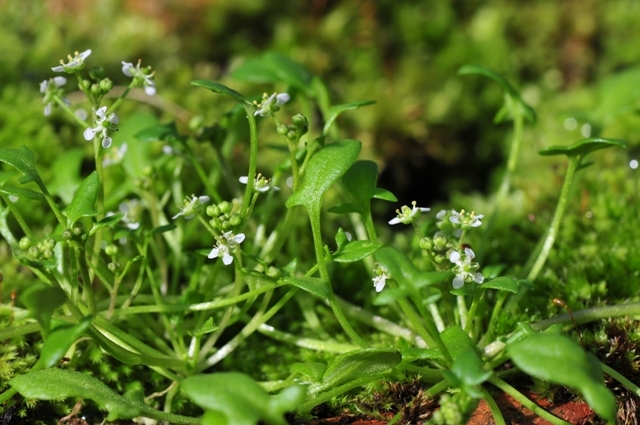 I believe that von Mueller did his PhD on the Shepherd's Purse. So presumably he was not responsible for the "common" name. I wonder what was!